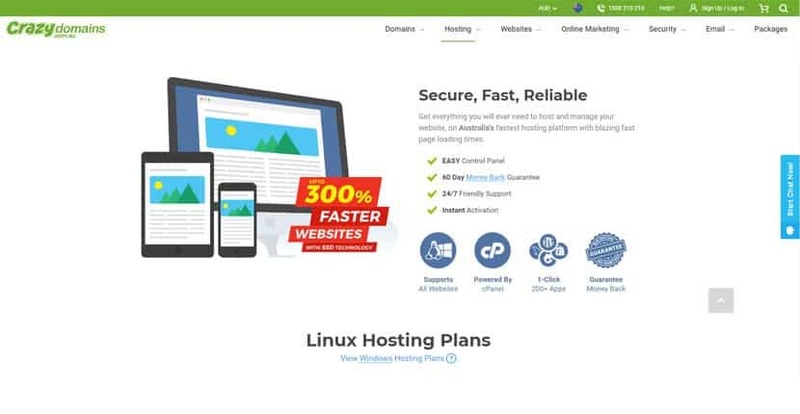 CRAZY domains Review 2019: Is CRAZY domains a Good Hosting? Crazy Domains is an Australian hosting provider with servers located in multiple locations worldwide. They have a superb 99.99% uptime Service Level Agreement, 24/7 customer service, and feature-packed plans. Crazy Domains is an Australian hosting company with a worldwide presence. Founded in 2000, they have offices in Australia, Europe, Asia, India, New Zealand, the Middle East, the U.K., and the U.S. They have different versions of their website depending on your location, such as in Australia, Hong Kong, India, Indonesia, Malaysia, Philippines, Singapore, UAE, and New Zealand. However, the website is always in English. All plans come with cPanel (Linux) or Plesk (Windows), a one-click installer for over 200 programs, and detailed visitor statistics. There are also plenty of features specifically for advanced users such as FTP, FTPS, and SSH access, support for PHP all versions (including 7), and advanced coding languages such as Python, Ruby, Ruby on Rails, and many more. The Windows plans support ASP and ASP.NET frameworks. Cron jobs and error logs are also available to ensure your website runs optimally. Two features that particularly stood out to me with this provider are that with higher-tier plans, databases are hosted on an SSD-equipped server and that anti-DDoS attack mitigation is included with all shared hosting plans. The former is rare with most providers as typically, only the files will be hosted on SSD servers. The latter is also uncommon except with more premium plans, which shows that Crazy Domains has made an effort to invest into solid infrastructure. 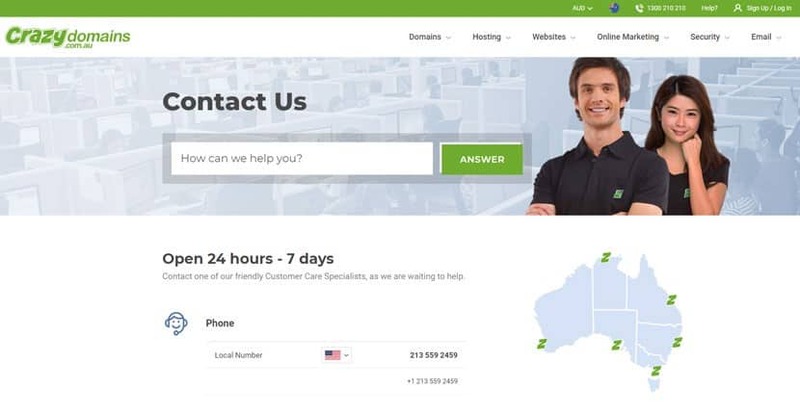 Crazy Domains owns data centers in Australia and the U.K., as well as co-located servers in the U.S., Belgium, India, Hong Kong, and Singapore. They use robust Dell technology networked with Cisco routers, combined with N+1 UPS redundant power and load balancers. Their network is fully redundant and they’re so confident in their technology they offer a 99.9% uptime guarantee. What’s more, they have 24/7 certified engineers. On first glance, the prices look very cheap. However, once you enter the checkout it becomes apparent that to net the lowest rates, you need to purchase a whopping 120 months upfront. Secondly, they have a lot of upsells during the checkout process such as website backups, SSL certificates, and visitor analytics. These are often included for free with other providers, but with Crazy Domains they’re all added costs. The one upside is that they give users a high level of resources and features with their plans. However, if you don’t really need tons of storage and email addresses, you’ll find Crazy Domains rather overpriced for your purposes. You can buy plans in three, 12, 24, 36, and 120-month terms. I’m not sure that I, or most new website owners, would commit to a ten-year term, but I do appreciate the significant discount. Crazy Domains does make an effort to counteract these lengthy terms by offering a generous 60-day money back guarantee. They have 24/7 sales and technical support. Remarkably they provide local phone numbers for approximately 20 countries around the world, as well as email, fax, and regular postal mail. I was a little annoyed by their support protocols though: they have a live chat window that perpetually states that they’re online now, but once you submit a message, it’s clear that it’s just a lead generation form to get customers to send an email, which I find a little misleading. On the plus side, I did get a friendly and helpful response to my question within minutes. Alternatively, if you prefer to solve problems on your own, they have a substantial knowledge base and an extremely popular Facebook page. onClick="trackClickout('event', 'clickout', 'Vendor Page - Visit User Reviews', 'CRAZY domains', this, true);"
I contacted crazy domains to move all my website domains and emails to them, they said they would email me details how to change over. After 30minutes i rang again to see if they had my right email address... yes they did but were to busy with other calls i was told they would email me in the next 30minutes... never received an email. If you want business you need to be prompt and follow up. Would not try to use again ever! I have been using their services for over 2 years, I am quite happy with their service. Their customer service is a bit slow at time but I think the products are value for the money I pay. I recently purchased Virtual Server from them. It took 3 days to set it up for me and make it up and running. During this three days, I have contacted many times to customer service, and every time someone replied by saying be patient. The process takes 24 hours!! After 72 hours, they could manage to make it working.The other experience I got with them was purchasing a windows hosting service for ASPX. On the product page said it support crystal report, so I purchased it. When I was setting up my website, I found out that the CR is not working. I contacted the custom service, and they said you need to purchase another product as well which would cost me about $70 a month.Their service is really poor. Crazy Domains is a large international company with an impressive customer satisfaction rating of 93%. They’re best recommended for organizations with larger storage requirements, however, as their plans tend to be somewhat overpriced for those who only need a simple, basic website. Wondering how CRAZY domains stacks up against other Web Hosting companies? Enter any other Web Hosting company and we will give you a side-by-side comparison.